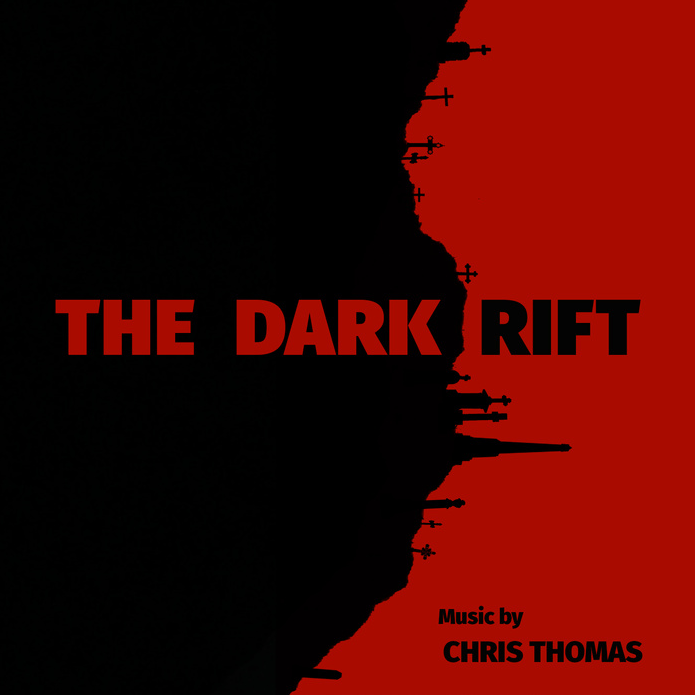 Another year has passed and the time has come for a new collection of Chris Thomas’ themes from various haunted attractions around the country. The Dark Rift brings us selections from Evermore Adventure Park, the Los Angeles Haunted Hayride and Albany Haunt (among many others) made especially for the 2014 haunt season. Just like last time, Mr. Thomas made sure to get a little help from his friends. He was joined in the vocal work by Sophie Spencer, Flora Spencer, Charles McDonald, Coralee Choules, Josh Bedlion, Justin Meyer and Sam Weller. Sam Templeman has once again hit it out of the park with his cover art and the lyricists from A Child’s Nightmare (Justin Meyer and Nikki Muller) are back as well. But the rest is all Chris. Before I get into my review proper, I also want to note how the following tracks featuring a woman singing “La la la” at some point: “The Dark Rift,” “Gate of Hades,” “Demon of Hades,” “The Dark One Rises,” “Golgotha” and “Flight of the Crows.” I mention this not only to save myself time, but to also let those who want to establish a running musical theme in their haunted attraction know what to use. “The Dark Rift” kicks things off with a heavy buildup, haunting piano work and ghostly wails. The lull before the loud chorus sudden bursts in will surely mislead any listener. The organ and strings go nicely with the unisex voices singing in Latin, too. Did I also mention there’s a rock section as well? A loud horn implies heavy footsteps in “Clown Castle,” which are soon joined by clowns laughing and merry-go-round music. The sense of menace lurking just underneath the cheery stuff is simply perfect. Sometimes it even bubbles to the surface thanks to the wordless vocals. The eerie opening of “Gate of Hades” calls back to the first track. I just love the ghostly effects and piano work in this. Its melancholy nature and music box segment allow for its use in several types of haunt areas. When in doubt, just hit guests with a Pepper’s Ghost effect. “Demon of Hades” is a brief rock version of the preceding track and it is amazing. The distortions and twisted vocals really sell this one. String work opens “The Witch’s Woods,” aided by female vocals and piano work. The music makes it very clear the woods are a place of mystery and danger. But despite the name, I can see this working in any witch-themed area in your haunt. “Little Devils” is sometimes known as “Wicked Little Devils” and it is quite the interesting surprise. It’s a song designed to remind you of something from an old children’s Halloween album. The addition of scratches adds to the feel of an old record playing and the method how the sounds of doorbells are integrated into the music is a delight. Here’s how I see you using this for a haunted house: people enter a room set up to look like the inside of a typical house on Halloween. There are a few decorations set up and there’s a bowl full of candy on a small table by the door. A record player turns on by itself and this track plays. If the song’s message and candy bowl don’t lure people towards the door, the sudden knocking will. But when they approach, a head suddenly bursts up from the candy bowl! Your hidden helper is disguised by a helmet covered in candy, a plastic bowl with a hole cut in it and a variation of the old “head without a body” trick. You could get away with using a tablecloth, but people might suspect something is up that way. You don’t just want to scare them; you want them to wonder how you pulled it off. “Hydra’s Lair” is not what you would expect. There’s no hissing monster or cave ambiance. Instead we get male voices chanting in Latin, soon followed by unnervingly eerie tones. Strings are the thing in “The Dark One Rises!” and they get quite the workout. The sudden transition to subdued guitars and wordless female vocals is very effective. “Osiris’s Underworld” effortlessly combines tribal drums, sneaky strings and male chanting voices to create fear and dread. Don’t let its name trick you into thinking this can only work in a mummy’s tomb. It yearns to be paired with dark ceremonies and other scary settings. “Hillbilly Stalkers” is the album’s shortest track thanks to it being well under a minute long. Its beautiful and folksy feel defies expectations of some reject from Deliverance. Its use of violins and ethereal vocals bring in the horror aspect. Have this play when people first enter your haunted swamp or spooky redneck shack rather than trying to loop it. Using it with a motion sensor is highly recommended. “Storming Vampire Castle” feels like something from a lost Hammer horror film. Those sweeping and epic horns, the creepy strings and bells and the pounding percussion which sounds like the clash of swords! This would be spectacular even without the vocals and organ work. You simply have to use this in a haunted throne room or Dracula’s lair. “The Witch’s Curse” is filled with exotic, yet folksy music. It also has a creepy woman chanting, whispers and wordless unisex vocals. Haunting vocals are also a major part of “Golgotha,” along with piano work, organs and violins. It also has lighter moments which allow its use in a nursery scene. “Flight of the Crows” is fast and intense, with plenty of cello work and female chanting. Mr. Thomas told me this was used for a scene involving crow people hanging from swaying poles. Somehow I get the feeling nobody reading this will be trying to recreate that particular setup. “Bobo the Clown’s Porcelain Nightmares” starts with the distant sounds of people at circus. The crackling effects layered over the carousel music remind me of an old loudspeaker. Evil clown laughter cuts in and out and the music deteriorates into unevenness. “Freakshow” offers a new take on the folksy exoticness I noted earlier. It’s good for general listening as well as haunting. “Halloween Comes Tonight” is another wonderful kids’ record throwback, only without scratches or pops. The dreamy percussion and pianos of “Only In Dreams” are far too beautiful and leaves one wondering if this was included by mistake. It’s not. In fact, it foreshadows something much spookier later on. It could also be used in a funeral scene. Spooky strings and the overall feel from other folksy exotic tracks make up “The Bard’s Tale,” which is also home to an incredible string duet. “Ghosts of the Great War Triage” is a much more supernatural take on “Only In Dreams” and the sound effect used at the beginning let you use it in a room where an audio player turns on by itself. Let the patrons focus on the music so they’ll never suspect the performer sneaking up on them. Having someone pop in through the curtains of what appeared to be an outside window is even better. While it has many of the touches I noted from previous tracks using this concept, the addition of storm effects and ghostly wailing add an extra sense of fear to “Haunted Backwoods.” Its restraint in parts is also an interesting change of pace. This is just the album you need if you think you’ve experienced everything the world of spooky ambient music has to offer. The inclusion of several tracks which double as regular listening music are also a nifty bonus. They really make me want to seek out his soundtrack to the film Grow Up, Tony Phillips. Especially since it involves Halloween! With only one exception, all the tracks are easily looped for individual use. I don’t know how Chris Thomas will top himself next year, but I am absolutely certain he’ll do it. Special thanks to Music For Haunts for use of the image!